More importantly, can we improve our service to those who really matter – the blind, partially sighted and those who find it difficult to read printed material. 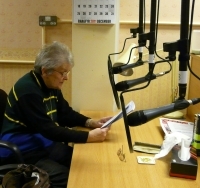 We record a variety of Welsh books, books that have a bearing on Wales but written in English, magazines, community newspapers, even an aural version of the Radio Times. We realise that many are unaware of what we have to offer. We ask you to help us to publicise our service and encourage new listeners to join us. Please act as our agents and inform Linda of potential new “customers”.